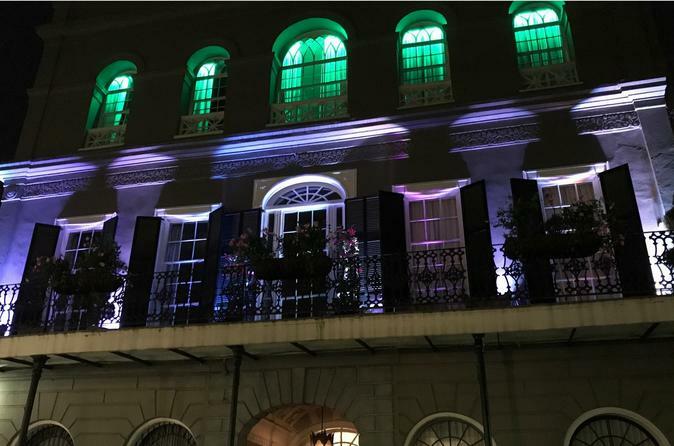 Embark on this 2-hour haunted cultural walking tour in New Orleans with a local guide. You will go on a walking tour in the French Quarter and discover the most prolific tales of New Orleans as you meander through the mysterious and mystical realms of Voodoo, Vampires, Ghosts, Witchcraft, and Pirates. Please choose from one of 2 departure times when you book. This tour consists of 5 separate Haunted Tours rolled into 1 legendary tour. This saves you time and money all the while making it exponentially more exciting! On this fun filled tour you will share a few chills, a few laughs, and a little morbidity as you explore the legends and lore that have made New Orleans famous! New Orleans is called America’s Most Haunted City for good reason, and on this tour you’ll see exactly why! You will visit the sites of actual documented hauntings and your guide will share with you the most ghastly and horrific history that New Orleans has to offer. Unlock the mystery and get ready for the true paranormal experience that only this tour can offer! You will experience Jaw Dropping, Heart Stopping, Immensely Thrilling and Spine Chilling Fun!